That same weekend that Ryan was visiting, I was trying to keep pace with what he wanted to see and do. Our next stop in Seattle after the Great Wheel was the Chihuly Glass House and Garden. 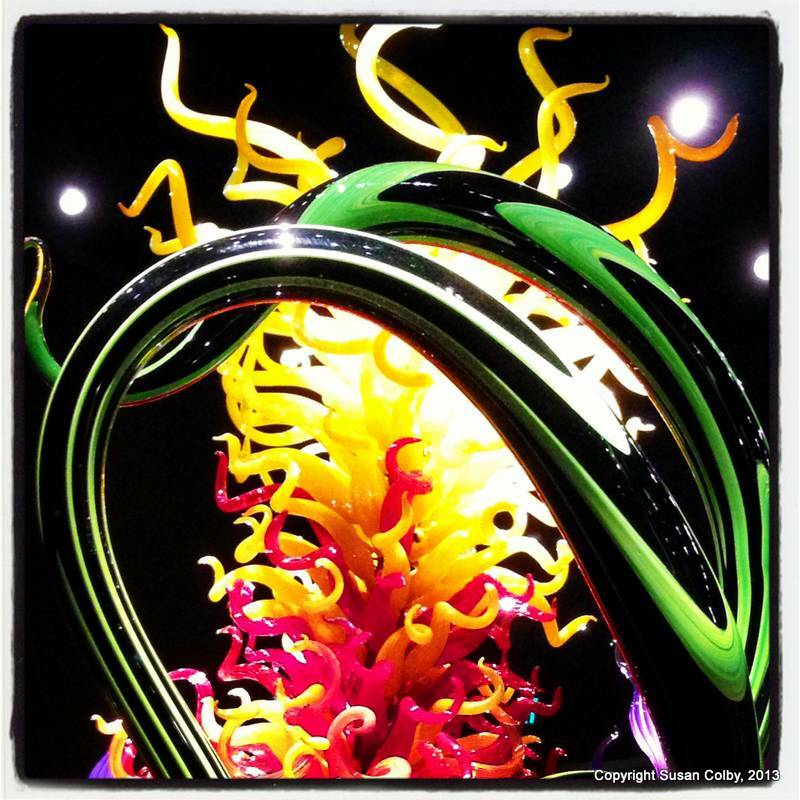 I had seen the Chihuly Bridge of Glass in Tacoma but hadn't even heard about the Glass House and Garden! Shows how isolated and out of touch I have been. This place should be on every person's bucket list. What an awe-inspiring, mind-blowing, spectacular place! The colors, the art, the the the the ....just everything! How beautiful! And to be able to see it with my wonderful son was the icing on the cake. This is a place that defies description. It is eye candy for the soulr. It is a place you have to experience. And although photos don't do it justice, I took a lot of pictures. Interior lighting was spectacular, illuminating the art so it stood out from an often black infinite space. Impossible colors pop and even though there are numerous people around, I felt as if this was done just for me. The gardens were a mind-blowing experience, and I can only wonder what it would have been like if the sun had been out! Complementary colors, shape against shape, impossible colors glowing among nature's own, natural flowers. How could I have missed seeing this place? Now I know it's there and whenever a visitor comes to my house, this is on the list of must-sees. I do have one suggestion, though. DO NOT take small children! There is just far too much priceless glass around for exuberant youngsters! Send them to Grandma's house and show them the pictures later! You will be so on edge and nervous, making sure they don't touch anything, that you won't be able to enjoy the beauty.